Paying for Microsoft Office? Well, well, well, there’s always Microsoft Office Free Trial & Office Online! No doubt, Microsoft Office has been reigning office applications category since made its debut back in the 90s. That said, the software comes with a hefty price that can make pockets go dry. The Microsoft Office 365 subscriptions start from 69.99$ per year to 150$ one-time buy for Home and Personal subscription. The other professional/business Office 365 subscriptions can go as high as 13$ per user/month for an annual commitment. And the Microsoft Office 2016 Home & Business currently costs 209$ for a single PC user license. But hey, that doesn’t mean you have to pay for it to use! Yes, there are multiple ways to use Microsoft Office for free, and without — or to some extent — having to compromise any premium features. It’s 2018, and every app, the software we use or have been using has come to online presence. There’s no such thing as offline-only existence app. And that’s what Microsoft is doing — gradually expanding the numbers of Microsoft apps you can access and use online for free. Office Online offers all the essential web-app version of the Microsoft Office Suite for free. It’s really easy. 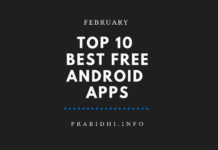 Go to this webpage, pick an app you want to use for free, and sign in to your Microsoft account to get things started. And even if you don’t have Microsoft account, you can always create one for free. However, if you are already signed into your Microsoft account, you can directly visit Office.com to choose the free Office web-apps. However, you have to settle for fewer premium features. The Office Online doesn’t offer full-fledged features; you’ll be missing features like Text boxes, Equations, WordArt, Charts and more in Word Online. Plus, to the downside, you’ll always have to online to use it for free. But doing the simple tasks like opening the files, editing them and syncing them to your OneDrive won’t be a problem. Like said earlier, it’s 2018, and it’s kind of become mandatory to have a mobile app version of any products (PC software). And Microsoft comes with all the office suite available for as mobile app versions! The Office Mobile allows similar features to what the Office Online offers! The only thing you need to do is Microsoft Office free download from the respective store! You can open, edit and sync your documents directly to your OneDrive with little to all features available there. For Android, there are two versions of the Office Mobile; Legacy version for Android 4.0 and up, and stable latest version. 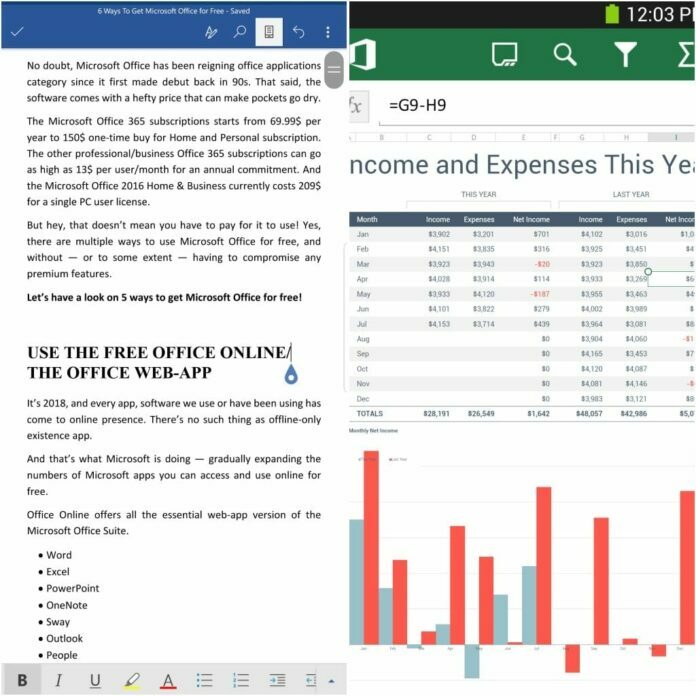 The legacy version is an all-in-one Microsoft Office Free Mobile app with top office suites, while the new Android OS users can download individual office apps from the Play Store. And for iOS users, there is only so such version as a legacy version of Office suite. Every office apps can be individually downloaded from the App Store for free. However, the iPad Pro users have to have Office 365 Subscription in order to use the office suite, which means the Microsoft Office is not free for iPad Pro users! 3MICROSOFT OFFICE FREE TRIAL: TRY 1-MONTH OFFICE 365 FOR FREE. What do you get with 30 days Microsoft Office Free Trial? 1TB of OneDrive cloud storage for up to five users. 60 Skype minutes to call mobile phone and landline in selected regions/countries! The only catch to this is you will need to provide the payment information (like PayPal or Credit Card) before you proceed the download, so when the trial ends, your account will be automatically charged £79.99 per year. Yup, **DRUM ROLL** there is another Microsoft Office FREE Trial. In fact, this one, from the Microsoft Evaluation Center, is more complete than the previous trial offer. The O365 ProPlus Trial can be for 30 to 60 days with Skype for Business as an extra additional app to Office 365 Trial. 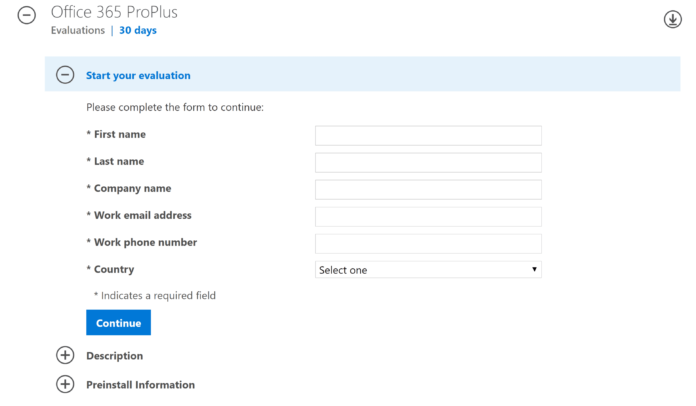 Go through O365 ProPlus Trial and register for another 30-days MS Office free trial, and for further information on what O365 ProPlus includes, visit Plan O365 ProPlus. Microsoft Development Center, unlike Microsoft Evaluation Center, gives early Preview releases to try. 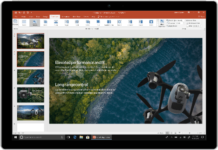 With Microsoft Collaborate you can try Microsoft Office 2019 Preview for an unlimited period of time until it releases officially. Oops, yes, this doesn’t sound like a way to get Microsoft Office for free. But hey, you can still get complete Microsoft Office suite for free [most of them] compatible and available for all the platforms; Windows, Macs, Linus, iOS, and Android. 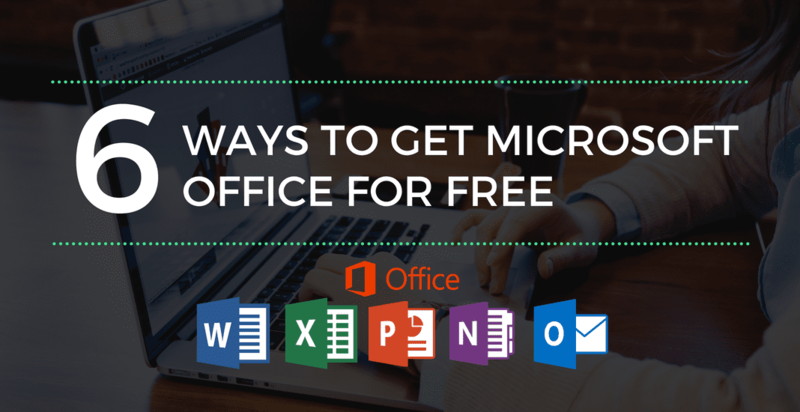 If you readers/visitors are aware of any other legitimate ways to get the Microsoft Office for free, you can always share your knowledge down in the comment section. We will, surely, update them — if legitimate — in this post. 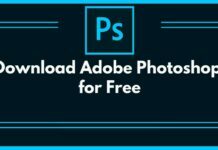 So, make sure you have this post bookmarked if you don’t want to miss the update on how to download Microsoft Office for free. Getting things for free is always for fun, so get this fun going with the latest updates on by following us on PRABIDHI INFO FACEBOOK and TWITTER!